Great looking black polypropylene art presentation books with distinctive sewn fabric edges. Features archival quality materials to protect your work and acid-free black polypropylene inserts. Great for presentations or storage. Economically priced. 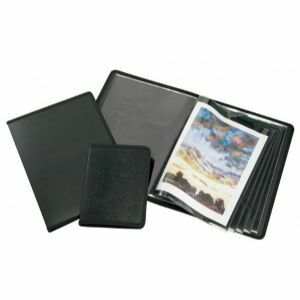 Comes with 24 top loading polypropylene pages, holds 48 photos. Available in ten popular sizes.